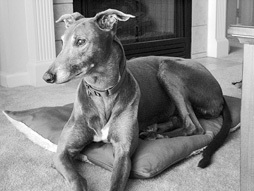 Our greyhound that we loved with all of our heart Kentucky had to be put to sleep on June 20, 2017. Exactly 5 years and 10 months after we adopted him from NGAP on August 20, 2011. 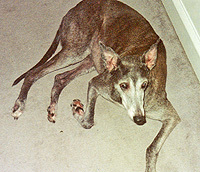 Before Kentucky I had only seen a greyhound by visiting and walking my cousin′s greyhound from Delaware. 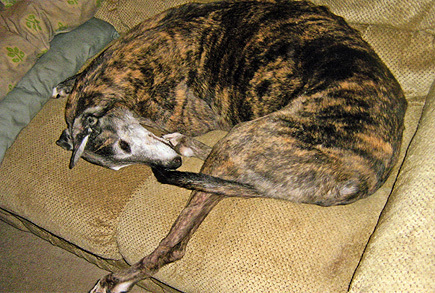 In 2011 I realized that I wanted to get my first ever dog, and for it to be a greyhound. I happily found NGAP. I remember filling out the paperwork and actually had Kentucky as my top choice for what dog I hoped to be selected with. We got to Philadelphia and we were told we were getting Kentucky. My Dad and Grandmother wanted to know if he would play fetch, so Bobbie gave us a stuffed bear or dog toy. Kentucky ran for it. Bobbie even let us keep that stuffed animal. As we drove home from Philly to NY, almost the entire ride Kentucky stared at me. I′ll never forget that moment looking into his eyes. The following day was a bit hectic, as Kentucky was watching TV with me as we had a big storm pass by. We suddenly heard a loud crash. A neighbors big tree had crashed down into our yard. A entire side of fencing was knocked down. I felt bad that Kentucky would have to wait to be able to run around in the backyard. Later that day we went outside with Kentucky on a leash. Another neighbor who had his fence knocked down by the tree climbed over the fence but tripped towards my Grandmother. Kentucky pulled on the leash and barked. We were surprised that he could bark, and realized how protective of us he had already become. Two weeks later the giant tree was gone and a new fence was put up, Kentucky got to run around in the backyard and was so happy. Every single morning when Kentucky would go outside he would walk along the entire yard, walking alongside every inch of fencing. He would check every bush then he would sit and stare at my parents porch waiting to see my Dad exit to greet him. Each of us loved Kentucky so very much. We each had our special moments with Kentucky. Myself playing with Kentucky in the backyard and rubbing his ears. He absolutely loved me rubbing his ears. He loved going on long walks with my Dad. He loved my Mother′s belly rubs. He loved my Grandmother soo much. Kentucky would follow me and my Grandmother all around the house. He our stare out the window and cry whenever either of us would leave. My Uncle loved him a lot as well and Kentucky meant a lot to him. My Uncle was battling cancer and was a big man, Kentucky was always afraid of my Uncle. I was unsure it was because of his size or because he could sense how sick my Uncle was. For my Uncle′s last birthday with us, I was able to get Kentucky to lay on my Uncle′s bed. It made my Uncle′s day. Kentucky soon wasn′t as nervous around my Uncle as before. A few days before my Uncle passed away, Kentucky surprised my Uncle and sat down right next to him and let my Uncle pet him. Kentucky loved going on walks. Whenever any of us would say the word "walk" or even spell it out. Kentucky would jump up and run to whoever said it. He would jump up and down putting his paws up on the counter trying to get the leash whenever someone went for the leash. Even if you accidently bumped into the leash, Kentucky would even wake up from his sleep and come running. Whenever you would hook the leash up to Kentucky he would want a part of the leash put in his mouth. He would then run around in the backyard carrying the leash in his mouth. He would always get so excited. He would keep the leash in his mouth until he left the driveway. Kentucky loved my Grandmother′s car. We had to stop parking the car in the driveway by the fence as Kentucky would stare at the fence and cry. On Saturdays when we went shopping we had to start driving the car into the backyard and opening the two rear doors. Kentucky would run outside and jump into the backseat and fall asleep. He would always want to go for car rides as well, sometime we would take him for a walk but he would stop at the garage and not budge. 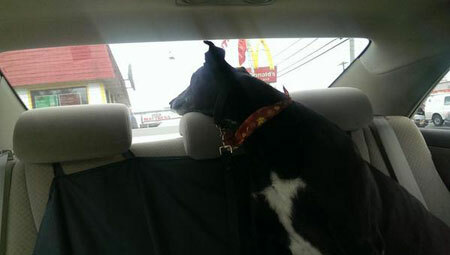 When he went for car rides he would sit in the backseat and stare out the window. Whenever any of us bought Kentucky a new toy(which we bought many of them) I would place it in the backyard and Kentucky would come running into the backyard and grab it. He enjoyed playing fetch with us, but most of the time enjoying playing with himself. He would pick up the stuffed animal and run with it, he would let it go out of his mouth. Run after it and jump high into the air catching it with his mouth and running all around the backyard doing it over and over again. Sometimes he would throw it up in the air and he would get confused and run in circles thinking it was still up in the air. Anyone that ever saw him loved him, and said how greyt he was. Sometimes when he was being walked, people would stop their cars to meet him. Kentucky loved to bark when he wanted something. Whether it was a treat, go for a walk, or to go outside. I will always remember him forever. I could go on and on talking about him, I loved him more than anything. I′ll never forget those eyes of his. He was so special. I will always be thankful to NGAP, Mr. Wolf, and Bobbie for selecting such a wonderful dog for us. Thank them for having such a great website with helpful info and always being available if we need help with a question. NGAP′s page about Soloxine helped Kentucky so much, you could see the change when he lost his personality it helped bring his personality back. When Kentucky got sick at the end of his life, I remembered NGAP′s page about the gift of life and the gift of death. I knew I had to give Kentucky the gift of death when his quality of life had gone poor quickly. As I laid with him saying goodbye and rubbing his belly one final time, I had placed that original stuffed animal Bobbie had given us on our adoption day. Kentucky entered our life with that toy and I wanted to make sure he was with it when he left us on this earth. I buried that toy with him so he would not be without it. 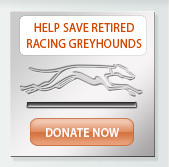 I will be starting the process of giving another greyt greyhound the gift of life someday soon I hope. But Kentucky will forever live on in my heart as my first ever dog. He lived to be 8 years and 2 months old but my memories with him will live on forever, I′ll never stop missing him and I′ll never forget his eyes looking back at me. I know today he′s somewhere still looking back at all of us. To all my friends at NGAP Especially, Mr. Wolf, Michele, Donna, Barbara & Bobby it is with more sadness then you can know we had to say goodbye (for now) to our sweet, gentle, loving girl Diamond ( Dreamnofdiamonds #6836) that joined our family on May 15th, 2009. Diamond turned 11 on August 11, 2016. I′ll never forget the day she rescued us; she definitely picked our family for her forever home. Diamond had a few nicknames, puppyhead, Diamond girl, chunk, & puppy. She played like a puppy for a long time, it seems like yesterday she learned to walk up our steps. Before we knew it she was hopping up on my bed, which was a favorite place of hers to take a nap. Not to mention she had comfy beds all over the house. She slept in my room just about every night. For a long time she would make sure she came over and nudged me to get up and go out on her morning walk after getting her first dose of her twice daily meds. My Diamond girl loved to take her walks, being very stubborn about which way she wanted to go. 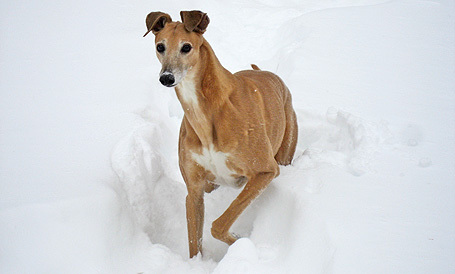 I always found it funny that she was rescued from a track in Florida but truly enjoyed romping around in the snow. They were some of our longest strolls. Diamond loved to get her treats but didn′t like to eat the crumbs she left, lol. Diamond didn′t bark so much until my daughters Italian greyhound Leo ( also a NGAP adoption) taught her how much fun it was. Then we couldn't get her to stop. My girl also loved when the doorbell rang and would excitedly run to the door so she could greet the visitors. Everyone who met her loved Diamond and always commented what a sweet girl she was. Not to mention she would lead you right to the kitchen and nudge you to the way of her treats. It′s hard to believe that she crossed the rainbow bridge. As my daughter said, it's the worst when you come home and our girl isn't there waiting to say hello. We will always have her in our hearts. Our daily lives were pretty centered around the care of our pup. Diamonds decline was pretty rapid. We weren′t expecting that she would be leaving us already. I wasn′t thinking that on the evening of January 2nd, 2016 when my daughter and I took her to the University of Pennsylvania Matthew Ryan Veterinary Hospital that she would not be coming back home with us. She was still smiling on our car ride there. After exams, testing, & consulting with the Vet, & spending the last couple hours with our fur baby we had to make the decision to let her suffering stop. We held her in our arms as she went over the rainbow bridge. It helps us cope by looking through the many pictures we have taken over the years. I look at them and they make me smile. My greyt had so much unconditional love. I′m so glad that Diamond was my girl. We will cherish her always and forever. Thank you all for letting us find each other. We loved Diamond more then we could imagined possible. She really was the sweetest dog ever. On Columbus Day 2016, our little girl went to heaven-a little spirit so pure the angels gathered to admire her luminescent wings. 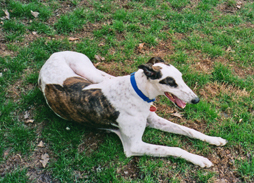 She was our third greyhound from NGAP and my “heart” dog. We will never be able to express to Mr. Wolf our eternal gratitude for bringing Noel (#6245) into our lives. She would have been 14 in January. 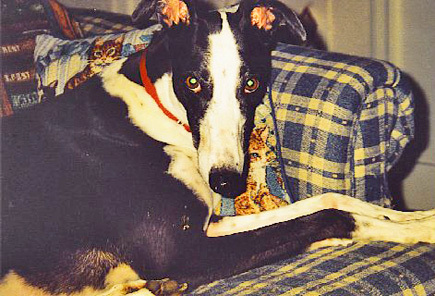 In Jan 2006, our first greyhound, Wish (#2564) passed and we were so devastated as was Wallace . We called NGAP in early February to adopt a young female, but at the time there was a waiting list for girls, so we contacted another agency and paid for (but would not receive for 2 weeks) a young black greyhound, Laci . Only a week into waiting for Laci, Vivien left a message on our machine to call her ASAP per Mr. Wolf. My husband called, and all I remember was his end of the conversation: Yes. Yes. Oh no. That’s a shame. Ok. Can we pick her up tomorrow morning before the Blizzard? He got off the phone and I was in shock. We’d never had 3 greys before! He made the decision without even discussing it with me, lol! Why? Noel’s story was quite remarkable: She was adopted by a family in Columbus, OH the year before as a 2 year old, and they just didn’t have time for her anymore in their busy family, so they called Mr. Wolf to ask him what they should do with her! [Vivien told my husband that Mr. Wolf sent somebody out to pick her up! From Philadelphia to Columbus, Ohio and back! His commitment to even one greyhound is unimaginable- he could have told that family to take her to the local pound. But he didn’t. And for that we are forever grateful. Vivien said Mr. Wolf said to call us… that she was pure white (very unusual he said), very sweet, and he didn’t want her sitting in a cage for even 5 minutes since she had had known a family for a year. My husband took pity also on this little girl he’d never met, and we picked her up the following morning before a huge blizzard, February 10, 2006. Now I know my story is getting long, but I must include my first meeting with Noel, as it is seared into my mind eternally. Usually, we’d go inside to pick up a dog, but for whatever reason when we got there, an attendant walked Noel out to us. As I stood there, she came out to me, looking at me, wagging her whole body, eyes smiling at me, souls connecting, as if she had known me forever, as if to say, “Well, it’s about time you finally picked me up!” And pick her up we did. She was pure white all right, except for a few gold spots on her ears that we called God’s glitter, and she had the most amazing ridge of hair (a Mohawk!) from the base of her head to her mid shoulders. The attendant said her former name was Lilo, and they carried the only thing from her previous life…a stuffed animal “Stitch.” From that day, Noel was mine, and I was hers. She was my heart dog, and wherever I went, she went. A week later, we received Laci, and Noel the white grey and the pure black grey Laci were inseparable. Their 8 year old “brother” Wallace reprimanded them outside (he finally got over his depression of losing Wish) and they completely ignored him as they disemboweled Stitch of stuffings in my backyard! When the dogs would ROO, Noel was obviously a soprano, and I very rarely heard her bark in 11 years, and when I did, she scared us all…even herself! When Wallace passed in 2009 of cancer, We adopted Moose (#7042), and then in 2011, we got the shock of our lives: Laci developed osteosarcoma at age 7 and passed 3 months later in June We were devastated. So it was just two greys for one year: Moose and Noel. To say that Noel and I were close was an understatement: Not only was she always in the same room with me, her EYES were always on me. When we went on vacation, I’d call every day to check on her because she was a mommas dog (Moose and Kinley were happy go lucky and loved everybody, not just necessarily me, ha-ha. My favorite habit of Noel was her jaw snapping. Every morning when I came downstairs, she would be jumping, doing zoomies, and SNAP, SNAP, SNAPPING her jaws…she sounded like an alligator! Even after she got older her balance faltered some, but not her happy spirit and jaw snapping! Everybody that met Noel knew what a special little girl she was. She used to do this thing where she would walk around trees slowly, and one foot at a time: tree houseplants, trees in the yard, Christmas trees…very slowly and one foot at a time. A dog whisper told us once she was “praying,” and another person said she was trancing…either way it was quite amusing and it seemed to make her happy. 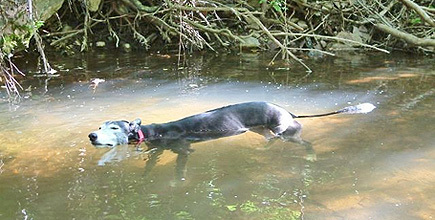 (You can see her in action on YouTube under: Greyhound walks around ficus; It’s quite amusing). 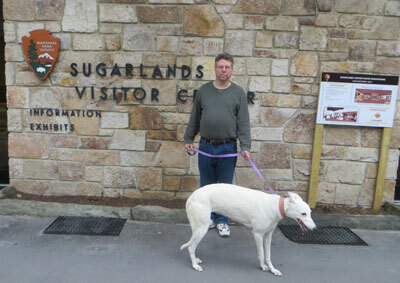 Once at greyhounds in Gettysburg, for fun we took her to see another dog whisper, who literally started crying! She asked, “Do you know how special your dog is?” to which of course I replied absolutely. She said Noel was an “empath” like her, and able to sense and take pain away. Now, by that definition, I would say all greys are able to do this but Noel did have her special talent. In 2012 we adopted young McKinley (#7491) who was immediately “mothered” by Noel, ear grooming and such. When young Kinley would do something she shouldn’t do, I would tell her, “No!” and Noel would emphasize my unhappiness by giving Kinley a non-contact SNAP near her behind!! Noel was quite well traveled: over the years she’s been with us to New York, TN, NC, and Illinois. For about the last four years, I knew this day would come, and I have been dreading it. I knew it would be horrible pain for me. We haven’t even taken any vacations for 3 years if we would be more than 7 hours’ drive time from Noel unless I could bring her with us. And so the irony was when we took her (the other two greys had a house sitter) to TN to stay in a cabin for a week vacay. The evening of day 2, she seemed to have some event where she couldn’t use her right back leg. We immediately drove home the next day and made an appointment with a dog neurologist in Annapolis MD, who did an MRI and said she had a FCE (fibrocartilaginous embolism). It’s like a stroke that happened to paralyze her back right leg. He said 50% of these pets will get better…50% will not… within 10 days. So we brought her home and took care of her like a baby. Her spirits were good, and she would eat like a hog, but she couldn’t walk unassisted and she would soil herself and we’d have to clean her constantly. She was always so proud, I don’t think she EVER had an accident in the house, so this was hard on her. We actually bought a wagon so she could join the family on walks to try to keep her spirits up. She tried and tried for me I know, but at almost 14 she was tired, and even though we stayed in contact with the neurologist, it became apparent after one week that she was not getting better. Her left back leg at almost 14 was not strong enough to support her without the right. Her spirits were good until the last day when she refused to drink, ate very little, and we noticed she had some blood in her urine…no doubt a bladder infection. We loved her so much, we would not let her suffer. In our living room, surrounded by dad, me, our other greys and our vet tech Meghan, we sobbed as we said goodbye to our little angel and best friend for 12 years. I told her if she wasn’t in heaven, it really wouldn’t be heaven, would it? We carried her little body out to Meghan’s car and placed her lovingly in the back. I kissed her glitter ears and her beautiful mane one last time with my tears. I told her I would love her forever. She was cremated, and my family has instructions to put her in my casket when it is time for me to go…she was my soul mate. We really still can’t believe she’s gone now; the house is so empty without Noel…even Moose and McKinley are depressed although I’m trying to give them extra love. The sunsets aren’t as orange. The fireplace is not as warm. The house has lost some spark…like eating your favorite food with a bad cold. I don’t hear that SNAP, SNAPPING anymore. We are devastated, but we thank God we had her as long as we did; we also thank the family who surrendered her back to you (our gain), and Mr. Wolf for bringing her into our lives. This is the only time I’m glad my husband didn’t listen to me! (He never lets me forget it either). I heard once the reason dogs don’t live to be 20 is so we can give another dog a good home. Maybe soon we will be ready, and we will call you Mr. Wolf. If you happen to meet another special soul who is a kissy Velcro dog, feel free to call us….you did quite well picking out Noel for us! As for you, Noel, I know you are at peace now. The joy you brought to our lives is not quantifiable. You were loving. You were funny. You were my best friend. The place you always laid in the dining room while I cooked in the kitchen, is now as empty as Tiny Tim’s chair. I will miss you forever. Show the angels how to do zoomies. Walk circles around the stars. Clean all the other angel greys ears. SNAP at the heavenly butterflies. And Remember always, as if you would ever forget: I loved you best. Sadly, I am writing this email to inform you that Dazey crossed the Rainbow Bridge on Sunday, August 7, 2016. She was 10 years old on April 6, 2016 and she was adopted on February 7, 2008. She had a spontaneous break of her right rear tibia and the x-rays showed the dreaded osteosarcoma. Up until the break she was not exhibiting any limping but I experienced the same scenario with my first adopted greyhound, Zippin. It was certainly a shock, but thankfully she did not suffer as she received excellent medical care from the Mt. Laurel Animal Hospital emergency. 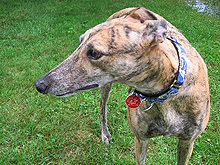 She is now running with all the other greys that I and my daughter have adopted from NGAP—Coach #1470, Zippin #2855, Taco #4280, Maiden #5676, Greta #5962, Macy #5804, and Cody #6208. Dazey was a sweet girl and loved her squeaky toys. She never got into any trouble and only barked at cats!!! 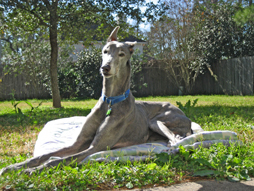 She also was the only one of the greys we had that loved to lay in the grass in the sun. I will miss her immensely. 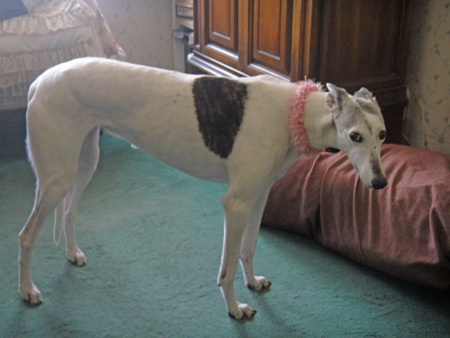 It is with great sadness that Brenda and I write to let you know that our beautiful greyhound, Kerry (CRT Kerry, adoption #7476), crossed the Rainbow Bridge on 20 January 2016. We adopted Kerry along with a female grey, Abbey (adoption #7488), at NGAP in July of 2012. Kerry was only 6 years old and we are so happy we were able to be his humans and give him a happy home for 3 1/2 years. 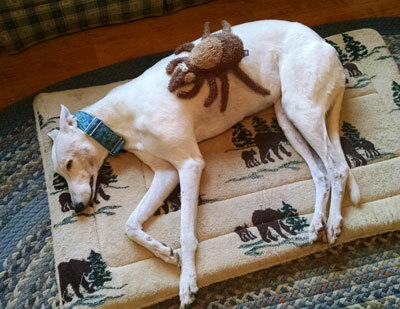 Kerry was diagnosed with Hemangiosarcoma in November 2015 following an internal bleeding event which required hospitalization at a specialty veterinary cancer center in Richmond VA. We brought him home deciding that we would not do any aggressive treatment. He was comfortable at home with pain and anti-inflammatory medications through his illness. The tumor in his left tricep muscle had increased in size very quickly over the last few weeks and finally dislocated his leg from his shoulder. We decided on the day that happened to let him go peacefully. He was surrounded by family, our local veterinarian staff and his beloved groomer in a serenity room at our vet. We have shared Kerry’s medical records with you by separate correspondence with the hope that it may be of some help should this diagnosis ever come up again in a NGAP adopted grey. Kerry was not only beautiful but the most loving dog we had ever met. He brought so much happiness into our home. To Kerry there were no strangers. He wanted to greet each and every person/dog we ever met on our walks and visits away from home. Everyone who ever saw Kerry had to stop, take a look, and ask questions. His funny ears (one brown, one spotted; one usually down, the other up) and his long snout always started the conversation. 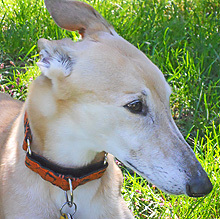 We always end our conversations with praise for the greyhound breed and the work you do at NGAP. Kerry was a big, beautiful boy. He ran with power and grace that made anyone who saw him stop in awe. His presence is surely missed in our lives and in our home. Abbey, his mate, is noticeably grieving. We are giving her as much love and time as she will allow us to give her. It is only time that will help us all adjust to his loss. We want to thank you again Mr. Wolf and your entire NGAP staff for the work you do. In time we hope to see you all in Philadelphia again. We lost our beloved dog SHADOW to cancer on October 21, 2012. Her racing name was WALTZ. She would have been 10 years old on November 2. We had her for 6 years and we never will get over loosing her. The house is so empty without her. We put in our application today for another greyhound to share our lives with. Thank you SHADOW for all you did for us and for how you enriched our lives. We will never forget you. My husband and I, with heavy hearts, wanted to let you know that we put our wonderful Silky to rest last Friday. She lived a good, long, happy life with us!! We miss her dearly. We have very fond memories of her. She loved to go on walks to a pond near our house. She loved to be outside in the sunshine. Silky would be so excited to go outside. She would run to the back door, bolt out onto the deck, run down the steps and then lie down. She would never beg for food when we ate dinner. She would set herself in the family room with a clear view of the kitchen table and wait patiently for any leftovers. We have two boys who are not fond of broccoli, so they would often "share" with their "girl dog". Our house seems so empty now. 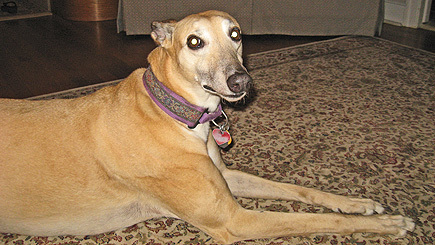 Even though she was a quiet hound, she was a BIG presence in our home. 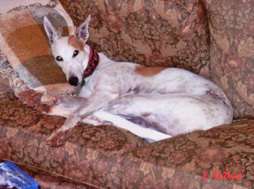 Silky lived with us from December of 2001 until August of 2013. We have numerous pictures of her around the house. Our youngest son has a replica stuffed animal of Silky (Shelterpups.com) that Santa brought him last year. He took two of Silky's tags and placed them on "little Silky's" collar. Every time we hear the jingle of tags we look around for our old lady. 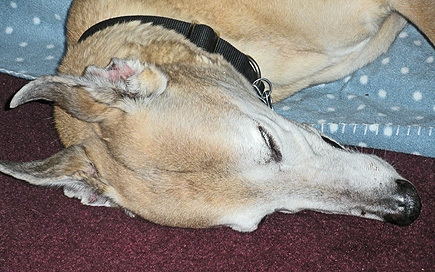 We are grieving right now, but will not survive long without a greyhound in our house. So when the timing is right, we will be heading down to adopt our 3rd lovable hound. It is in my deepest regrets to inform you that today our beloved Norma Rae has passed on at the age of 13 1/2 from organ failure. She was born in July of 1999 to an owner in New Hampshire and somehow found herself in your organization at the age of two. We adopted her in October of 2001. She was an amazing dog from the first time we came to look at the greyhounds. We always say that she chose us because she howled and pranced around the kennel she was in from the first moment she saw us. And she has never been a disappointment to us! Norma was a loved dog. We've always called her the mother hen because she was in a pack of four. Her siblings, Cinnamon, Rocky and Buddy will miss her as will all of her human family. Today she is now in doggy heaven chewing all the bones she wants. We ae sending this to inform you that what you do is outstanding with rescuing dogs but also that the homes these dogs are being placed in are wonderful to and the people truly love them. We will miss Norma Rae forever and are feeling her loss! The day I've dreaded has come for our family. We had to let our beloved Mona Lisa (aka Bianca)14 years old go to the bridge this week. While I've never posted to this thread before, I read it daily. It never seems to fail to bring a smile to my face or tears to my eyes, sometimes in the same digest. I've suffered each time someone posts about losing their grey, because I knew one day we would have to face the same excruciating pain. Mona Lisa came to us through NGAP in 2001. My wife, Erin, always wanted a greyhound so we contacted NGAP and eventually arrived at their facility to pick one that was available. We obviously did not know what to expect, but when we first laid eyes on Mona Lisa and she greeted us we knew she was the one for us. Before we could acknowledge our decision, the staff person asked if we would still take her since she was missing a rear toe on her rear foot. 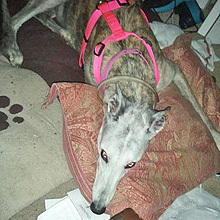 It seems a family who was looking to adopt a greyhound had rejected her because of her missing toe. As it turns out her missing toe turned out to be an amazing blessing for all of us. Mona Lisa joined our pet family and quickly staked out a place on our couch, bed and our hearts. She had an amazing personality and loved meeting and greeting visitors to our home. She loved to race around our backyard doing figure eights to everyone's delight. She also loved to stretch out in the grass in the sun for long naps, lazily flipping over, back and forth. As the years passed Mona Lisa's black muzzle gradually change from gray to white. She comforted us as many of our pet family went to the bridge. As she aged gracefully, our walks became shorter and her naps became longer. In the past few months her appetite also began to drop off despite being pampered with numerous treats as well as occasional helpings of chicken, steak and London broil. A few days ago she refused any food. Two days ago after she drank water from her bowl she immediately vomited it up. While cleaning it up I noticed small blood droplets. Needless to say I immediately scheduled appointments with our vet and the local surgical animal hospital. An x-ray by our vet revealed that her liver was enlarged. A follow-up visit at the animal hospital, and subsequent ultrasound, revealed that she was riddled with cancer numerous organs and was suffering from internal bleeding. With no hope and no chance for survival we made the painful decision to let her go. She died peacefully in my arms as I whispered in her ear how much we loved her. As I was putting away her beds and toys, I glanced up at our greyhound calendar, forgetting that her picture is featured this month. Our home will never be the same. While there will most certainly be more room on our couches and our bed, she will remain in our hearts forever. Saturday started off as one of the best birthdays I can remember. My career is in a great place, my wedding planning is coming together damn near perfectly, and my fiance had written out the most beautiful card and couldn't wait for me to read it. My three greys (Frankenstein, Zoe and George Michael) were happy as always because it was a new day to play and well, be grey! All five of us shared birthday cupcakes then did some cuddling on the couch. A few hours later we were upstairs getting ready to meet my brother for lunch when we heard the most blood curdling howls of pain you could imagine. We rushed down the steps to find Frankenstein lifting his front leg with the paw just dangling. I immediately called Bobbie who told me to take him to emergency. We got him to lay on his bed and once he did, he stopped crying. My fiance and I carried the whole bed with him on it right into the back of my truck. I sat in the back with him petting his head and telling him mommy would take care of him. He lifted his head a few times to get a better sniff of the outside world blowing in through the windows. Even though he was no longer crying, I was still anxious to get him help. I asked how much further and my fiance said we were close and not to worry. He said he isn't going to die, he's just going to get a cast and we'll all sign it and it will be adorable. We got to U of Penn and 2 vet students carried him onto a gurney and I gave my permission to x-ray his leg. In the meantime Donna had called and asked that I call Mr. Wolf right away. Mr. Wolf advised me that he had another vet look at the x-rays I had taken 2 weeks ago at NGAP (because of a limp Frankenstein had developed on that leg). He said it was really difficult to detect, but they saw osteo and none of the options were very good. I said ok and listened â€“ thinking he was telling me that my dog had arthritis. He explained that amputation and chemo was an option, but also explained how low the success rate was. I could have fallen over. Shock is an understatement for what I was feeling. I just kept saying okay but the situation was so surreal. By the time we hung up, the Penn vet was coming outside to find me. He told me the same thing that Mr. Wolf had said - but now, 2 weeks later, the xrays showed the cancer much more clearly and there was a 90% change it had already spread throughout his chest as well. The bone had broken just from him walking because it was so weakened from the cancer. As much as I was grasping at straws trying to think of ways around it, it was inevitable that it was his time to go. I wanted so badly to keep him with me but my fiance kept me grounded just reminding me that even though he hadn't suffered up until now, he would suffer if we tried to keep him going. They brought Frankenstein in on his gurney who believe it or not was actually pretty happy. He was just lying there taking all his kisses and pets and ear rubs and sniffing us. They started the injections and I just kept kissing his head and petting him. I felt his last warm breath on my face. I called his name a couple of times but there was no reaction. It took several more minutes for his heart to stop. He was so strong. They placed him in a kind of cardboard coffin and we put him right back in the back of my truck, on his bed. I called Mr. Wolf to inform him of the outcome and he had someone meet us at NGAP. Once there, his coffin/box was put on a gurney and we were led back to the crematorium. We opened it up and said goodbye one last time. He looked so peaceful and beautiful laying there. Just like he was taking a nap. I pet him and kissed him a bunch. His body was still warm and his fur so very soft. My fiance helped gently lay him down in the kiln before it was closed up and started. Once we got home I saw my future husband, this big strong tattooed muscular man, break down and full on cry. His best playmate Zoe is sad as well. She stands and stares at the front door, and sometimes walks into the kitchen and waits for the back door to open and him to come running through, because Frankenstein didn't walk, he ran. Everywhere. Just cause. He loved bananas, butter, spaghetti, salmon, and my favorite soup, Mrs. Grass. He always let me clean his teeth and his ears but trimming his nails was a different story. He ran around the yard away from me whenever it was bath time. He loved to rub his face all over his Dad's towel when he got out of the shower. I never went to the bathroom alone and I never minded. He loved lying on his Dad's lap to watch TV. He slept in our bed every night since the day we brought him home 3/18/09. He loved to run around in the snow like a mad man spraying our neighbors freshly shoveled yards in his wake. He never minded going out in the rain to go to the bathroom but wanted his thunder t-shirt if it was storming. I'm grateful I never kicked Frankenstein out of bed even when he stretched out his legs and left me with no room. I'm grateful I never got annoyed that he followed me everywhere including the bathroom, I was happy he loved me so much that he wanted to be with me every minute he could. I'm grateful everyone in my family met and loved him. I'm grateful he did not have a long drawn out illness. I'm grateful his last day was filled with cupcakes and fun. I'm grateful my friend Renie (aka Balto's Mom aka Daisy's Mom) showed me how to perfectly get in those ears for the best ear rub. I'm very grateful that Barb matched us up with such a wonderful dog. I'm grateful that Mr. Wolf was there to coach us through that difficult day. I'm grateful that when we arrived at NGAP Monday to collect Frankenstein's ashes everyone genuinely cared. Pat was so very kind on the phone. Michelle saw us first and cried with me. Barb came out and cried and thanked us for taking a chance on a 'return'. Donna got weepy. And she can try to deny it but I think I even saw Bobbie tear up a little. Just about everyone at NGAP knew Frankenstein, even people I didn't know. And if they didn't know him, they knew of him. He was a rock star. My life changed forever when Frankenstein entered it and it will never ever be the same now that he's gone. My heart is shattered in a million pieces and while it may be repaired in time, it will never be whole again. It’s Linda Prentice, from Rochester, NY area. I think you probably still keep records about all your NGAP adoptees, and I just wanted to let you know that we lost our sweet little Emma yesterday. Her number was 4689, named Boggle. She had failed a bit over the past year or so, with weakness in her back legs, but was still living a good life until yesterday. She even ran around the back yard a bit on Sunday. She had a sudden event, maybe a stroke, late yesterday afternoon and we put her to sleep. She was such a sweet dog…she brought us all so much love. What an honor it was to have her. Thank you for bringing her into our lives. I’ve attached a recent picture. What a beauty! 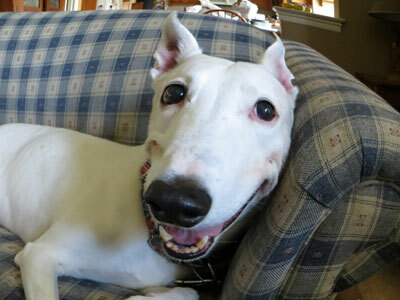 I wanted to let you know that our girl Dreamer (Dream - Adoption # 5059) passed away September 2012. We simply loved her since we adopted her in 2001. She was the sweetest dog. Thank you all for everything you do for greyhounds and the people who love them. I can't explain how much she meant to us, she will be very missed. She had a good life, thank you! 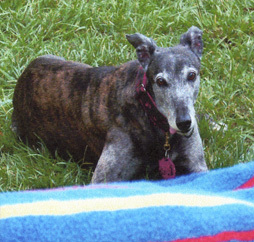 Thank you kindly for all the care that you gave to our beloved greyhound Cazar who crossed the rainbow bridge in December just shy of her 15th birthday. Cazar spent the first 5 years of her life on the track. She was a larger muscular female who had an impressive race record. Her next 10 years were spent in well deserved retirement as the Queen of our home. She had the happiest disposition of any dog we had ever known. She woke every morning with a wagging tail and a full gait run down the staircase. With the exception of cats, she loved everyone and everything, especially small children who wanted to pet her deceivingly soft white coat. Cazar was playful and funny and had a full tooth grin! In her senior years she re-learned how to bark and it would amuse her to hear it echo in the house. Even when on a leash walk she would never..ever let you cross the finish line first, sticking out her neck to win by a nose. Wild deer would stop and stare at her in amazement, not sure if she was one of them. Cazar always separated out the red Milk Bones from the others because she didn’t like them. Thank you Mr. Wolf for choosing the white dog we would have never chosen for ourselves and thanks to the staff that cared for her in life and helped her pass with dignity. She is sadly missed by our family but we have a lifetime of great memories. We hope she changes her mind about cats as she will meet up with our 3 Siamese cats already on the other side! 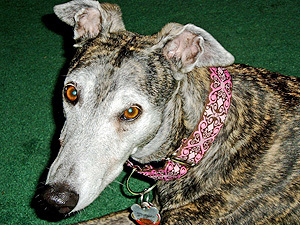 Just to let you know my precious galgo, Talia, died Saturday 11-12-11. She had lympho sarcoma. She was diagnosed in May 2011 so I got to enjoy her 6 months after diagnosis. She will be truly missed. I wanted to let you know that our beloved Suky was put to sleep on Friday after being diagnosed with osteosarcoma. 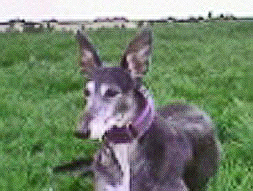 Suky was our first greyhound and our first introduction to the breed. We loved her very deeply ever since she came to our home in 2006. She was fun, outgoing and loved us very much too. Suky not only gave us much joy, but she started a whole new photographic body of work for my husband, Andrew Pinkham. Suky was so majestic and so photogenic. It was hard to take a bad picture of her. Attached is the first picture we took of her in Fairmount Park in 2007 and the last photo we took of her only a few weeks ago. Because of the success of Suky’s first image, we have now photographed many more dogs, cats and horses bringing so much joy to their owners and everyone who has seen them. We must thank Suky and NGAP for making all of this happen. Thank you so much for bringing us the greatest joy to our lives! 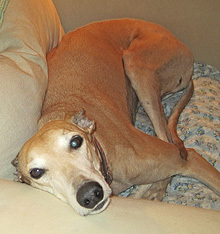 We had to say good-bye to our girl Sammy (#5912—racing name, Gardenia) in August. She was 12 years and 4 months old. Catch her in the “roach” position, give her a quick belly rub, stop… she scratches her ear with her paw to let you know your job isn’t finished. Another quick belly rub, stop… she snaps her jaws together and wiggles her head back and forth. OK, one more rub. And another. And another. It’s been two months since we lost her, and it still hurts me every day when she’s not at the door to greet me when I get home. We miss you, beautiful Sam. When our hearts aren’t quite so broken, we’ll return to adopt again. Thank you for all that you do. I first met Player in 2004. He was one of 19 captive blood donors at the Animal Medical Center when I visited there. He was easy to spot because he only had three legs. It took us four years and a lot of hard work to get Player out along with several other donor dogs, but we did it! He stayed with us here at the NGAP for a time and I would get such joy watching him out running in the yard multiple times a day. Since he was a tripod, he would always go out by himself but there were always dogs out in the adjoining runs for him to safely interact and race with. On December 19, 2009, Player was adopted by a wonderful family that loved him dearly and we featured him in a special calendar we published last year. Unfortunately, when you only have three legs to begin with, sooner or later that single leg will get tired. In April 2011, Player, who turned 12, left us forever. While Player resided at the Animal Medical Center, he never left the building. He never had a chance to run free. So the end of his life was very special for him and very special for me because we did the best we could. And I am sure he appreciated it as much as we did. He will be remembered. In 2000, we decided that our Siberian Husky, Sheena, needed a 'friend' to share her young life. 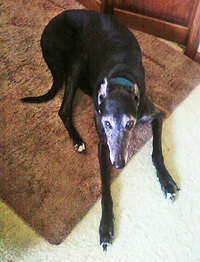 We thought that a Greyhound may be a good addition to our home and contacted the NGAP to see if that was a good idea. Although our first attempt did not go as we hoped, you worked with us to match our needs. We brought Sheena to your kennels and the moment that she say Misty, they began to play. For eleven years 'our girls' were the best of friends. That came to a close on June 8th, when Misty, at age 13, succumbed to bone cancer. We knew that Misty added a whole dimension to our lives, but we didn't realize the true extent of her bond with all of us until she was gone. The memories came flooding back and we know that eventually they will help us overcome the emptiness in our lives--our hearts. We cannot remember a time she didn't want to be with her best friend Sheena o with us. When she wasn't eating or playing, she would lay on one of her many beds hoping that someone would take time to pet her, or bring her another snack. She was never a problem, even when Sheena was recovering from surgery and they couldn't play. She was a good girl. As we try to accept the new 'normal' in our lives and Sheena, 'the furry one', learns to be an only dog once again, we think about Misty, 'the speedy one', and the true joy she brought to our lives. Maybe there will be another greyhound in our future but, for now, we will take time to cherish the memory of our departed friend. I would like to thank you for introducing my family to one of the sweetest dogs I've ever known. You all called her Frosty (adoption #6300). But we changed her name to Mango when we adopted her in May of 2006. Mango came into our lives and brought with her a charm and gentleness I hadn't experienced with a dog before. Of course, there were some crazy days as Mango adjusted to her forever home! But she acclimated to her human family as well as her "big" brother, our Yorkie named Simon. As time passed and Simon crossed over the Rainbow Bridge, we added a new "sister", Harley and a "brother", Neko. Not to mention our daughters added their own puppies, Millie and Ruby. Mango may not have always been thrilled with the new family members (she had a way of looking at me as if to say, "You must be kidding! "), she let them into her world with a calm, quiet attitude. On Thursday, June 7, 2012, Mango left us suddenly. She crossed the Rainbow Bridge without so much as a warning sign to us. Words cannot express what a void her absence has made in our family. Her departure has left me heartbroken. But I like to think about all the joy and smiles Mango brought to all of us everyday. I will never forget that sweet girl. I believe that Mango loved her family (she was not one to cuddle up to you, but she loved a good belly rub!). I hope that Mango knew how much we loved her and appreciated all she gave to our family. I am sad to report the death of Louie. There is no way to express the loss after having enjoyed his constant companionship for the past nine years. I have attached a picture of both Ana and Louie, the two wonderful Galgos you encouraged us to bring home that beautiful September day in 2003. We have been ever grateful for your choice of these two wonderful animals. This had been a terrible year and Louie was my comfort, my crying towel and constant source of sympathy these past months. His ashes will rest next to John's in our family cemetery. Thank you for letting us adopt these two great dogs. Our local vet diagnosed Girl with osteosarcoma in February 2012. She was treated for pain management through oncology and radiation at UPENN. I believe that she suffered little pain and she had a good quality of life while fighting her illness. Because she was 11 1/2 and just knowing Girl, I chose not to amputate her leg. I did not feel that it was in her best interest; however, it was not an easy decision to make knowing the prognosis. Girl passed on May 29, 2012. She is greatly missed. Thank you for allowing me to be her "mom"; it was an honor and a blessing. It with a heavy heart that I tell you we had to let our little Ashley cross the bridge today. We got her from you 8/7/09. She had complications from a liver problem that came out of nowhere. I can assure you that as much love as she got from us, we got more back from her. She was a GREAT dog, and she completed our home. There is a void now that is as big as the universe. She touched us, as well as anyone who had the pleasure of meeting her. We certainly had wanted many more years with her, but it wasn't meant to be. I saw her picture on your website before we were assigned a dog, and I fell in love with her. When we were told we would be getting her, is was as if a higher power willed it to be. Thanks for sending her to fill our hearts with love!! Until we meet again, "my baby girl". I adopted both Rancho and his sister Ruby at NGAP approximately 4 years ago. They both were from a broken home but were loved and cared for. I loved them both so very much. Unfortunately, I lost Ruby first and it was a shock. Early this morning, I lost Rancho to a sudden stroke, no suffering and gone. He was the most beautiful and precious boy, so gentle,so sweet. I called him my big white bunny. He will be surely missed. I also had adopted Schwartz from Kansas at NGAP. I shall never forget when he entered our home in Galloway, he walked up to the tv in the living room and stared at it in amazement. It was the first home he had ever been in. Just wanted the staff at NGAP to know they truly were loved and were given the best of everything in my care. 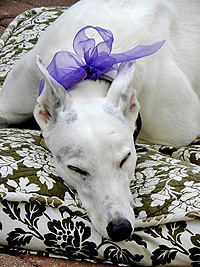 It is with great sadness I am writing to inform you that Violet, aged 13, went to dog heaven on June 20, 2011. Today, June 28, would have been her 14th birthday. Violet's racing name was Donce Dana, adoption #4177. She raced at Victoryland in Shorter, Alabama with her brothers and sisters, but did not make it to a betting race. I adopted her late summer of 1999. She was about 2 and a half. She had been returned to NGAP by previous owners, but turned out to be a great match for me. She was a smalll brindle with a crooked tail and one ear up and one down. Her black mask, legs and chest turned pure white as she aged. Violet lived a great life, she went along with us camping, boating and for any kind of road trip. She loved to travel. She also wagged her head, if any of you greyhound owners know what I mean. She also like her rear end rubbed, not her head, and she ran in her sleep up until the day before she passed. In her younger years, she would sleep-run so hard she would slide off her pillow. Violet was in amazingly good health in her late years, with the exception of a little arthritis which she took medicine for. She ran around the yard up until last year, when she slowed down to a trot. About 3 weeks ago, I noticed her breathing was slightly labored and learned she had an enlarged heart and fluid build-up around the lungs. She was cancer free and her bloodwork was still normal, so we gave the medicine a try, but after a long week she was not getting better and had stopped eating. She just was not the same happy dog. So with the help of Dr. Sangita Patel, her life ended quickly and humanely. Although I am heartbroken, I know Violet had a great long life and I was so fortunate to have so many happy and healthy years with her. Thank you NGAP, and Bobbie, who was my adoption connection, and to Dr. Patel who oversaw her medical care all these years. It is with great sadness that we tell you our beautiful Zebra (Craigie Zebra, Adoption #6104) needed to be euthanized on October. She developed a veryrapidly progressing osteosarcoma of the leg. Although our hearts are still heavy, we know we afforded Zebra a wonderful home for over five years, something she didn't have as a racing greyhound. She is sorely missed by us and her two best friends, Sobi (Kelsos Soundbite, Adoption #5909) and Rudi, our Rottweiler. Zebra took care of Rudi since he was a puppy, and they loved to play together. Thank you for all you and your staff do for the greyhounds. it was love at first glance, right from the start! Said, "Adopt this twice-returned 8-year-old, before it's too late,"
so the agency would know! You are certainly the epitomy of "You can't judge a book by its cover,"
You might still be in that crate, from the inside looking out at me!!!! That look in your eyes says you've also adopted me!!!!! You are forever in my life and forever in my heart!!!!!! A dog's love is as insidious as its hair. We find it clinging unexpectedly to our hearts as they gently insert themselves into the nooks and crannies of our lives. We can't begin to realize how often we think of them until they are gone. Does she need fed?... Does she need to go out?...Did I remember her medicine?...Is she comfortable?...Does she feel as loved by us as we feel loved by her? One can only hope. We will feel her loss for such a long time. As the weeks and months pass, time will work its mending on our tattered but thankful hearts. Little by little the pain will soften...until the day we pull on an old coat and there find a few of her hairs clinging to us softly. Our hearts will catch in our throats and it will remind us of the love and warmth she brought that will forever cling to our hearts. Thank you, Lord, for sending us the sweetest dog who ever lived. Please welcome her home. It is with a heavy heart that we let you know of Maddi’s passing on January 16, 2011 at the age of 10 years. Our toothless little wonder, our chubby little girl, our dear friend. Maddi fell ill over the Christmas holidays, but she hung in there just long enough for her buddy to come home from yet another stay at the hospital. Once James got home and into bed, Maddi comforted him as only she could. She passed away that night, having successfully made sure that James was safe and comfortable. She waited for that moment. Maddi was our third adopted grey. 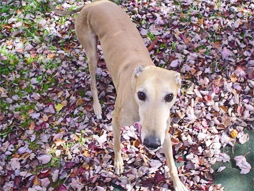 She weaseled her way into James’ heart one day as he visited the kennel, looking for a friend for our other greys, Noonan and Violet . She was outside with the rest of the females. When it was time for them to all go back inside, she broke away from the pack, ran up to the fence, and smiled. Yes, s-m-i-l-e-d and at that moment secured her forever home. And she never stopped smiling. We were very lucky to have her in our lives and miss her terribly. 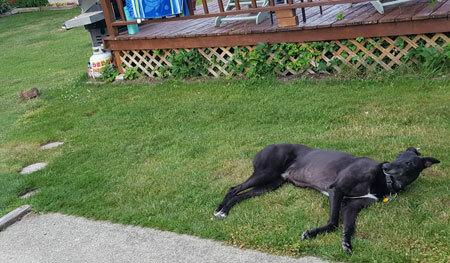 Yesterday due to the diagnosis of Osteosarcoma in our beloved greyhound Minee Miney Jo or as we came to know and love him as “Jo” my wife and I chose to have him euthanized at NGAP. It has been a very difficult 24 hours for us without our fast little friend. We spent the evening looking at the 100’s of pictures we had of him and really came to realize he had a very dynamic life and we tried to provide the most love and care we could for him. It was very difficult to send Jo to the rainbow when he appeared in good health except for his limp. My wife and I were very realistic and understood that even though he could have potentially lasted a few more months with pain management medication we both understood the severity of his terminal diagnosis. 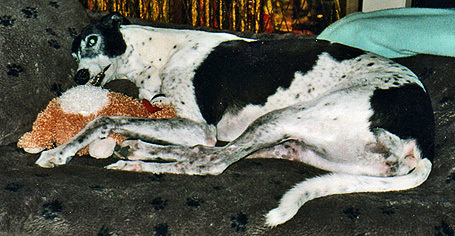 We would rather remember Jo as the happy, loving, caring hound he was then to see him suffer for our expense. In parting, Michele and I would like to thank everyone at NGAP for the providing excellent health care for Jo over the past 8 years and being very professional with him even till the end. We really appreciate all you do for not only our hounds but also the 1000’s of others you rescue and provide care for. I am informing you that we had to euthanize Samantha last week due to bone cancer. She has been a joy to us even with her many health problems. She was very comfortable the last few years and we will miss her. I will miss her singing along with the CSI show music. She trained all visitors entering our home as to the location of the "cookie" jar and if they hesitated she would nudge them along with her nose. 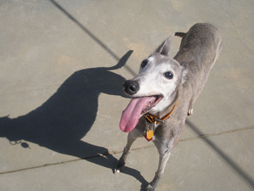 Sam was our second grey from your organization and we will be back soon to see you! Thank you for the service you provide and the happiness that you share with us. It is with great sadness that we announce the passing of our beloved Jaycie. 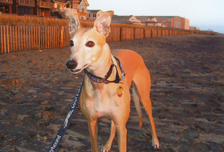 Jaycie died suddenly on Thursday March 3, 2011. After suffering several cardiac seizures, I had to make the difficult decision to help her cross the rainbow bridge. Jaycie was a sweet and gentle soul who brought such joy into our lives. 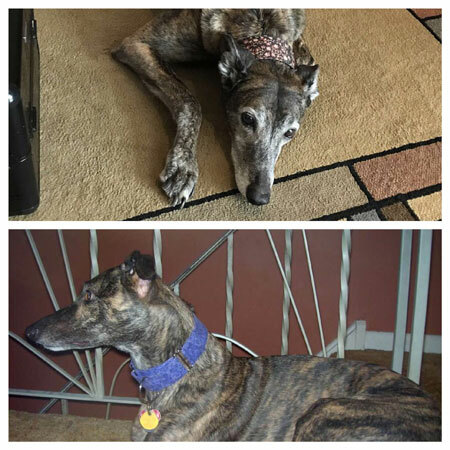 She enjoyed romps in the yard with her sister greyhound Lucy (adoption#6811), walks in the park and visiting a local nursing home and cuddling on the couch. This poem was written for her. with a heart that's over flowing with her special canine kind of love. 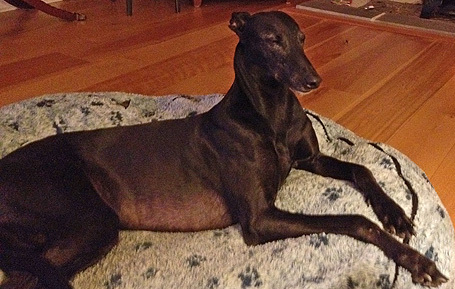 her luck changed when she was rescued, running now is something done for fun. 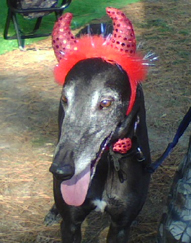 you could be a greyhound's angel, bring one back to their forever home. We love you Jaycie and will miss you greatly. It is with great sadness I have to report the passing of our sweet "Raleigh". He suffered from OS. When he tripped and broke his leg our only option was to give him the gift of death. He was a wonderful companion for both Chitza and Leia as well as my husband and myself. He loved to lay in the sun then splash in the baby pool. He loved going to the nursing homes to meet and greet the residents and followed every pet with a kiss. Raleigh was a large part of our lives and he will be greatly missed. I wanted to let you know that we lost our Wendel on November 8, 2010. We adopted him on 02/03/01. He was the best dog anyone could have asked for. In his prime he weighed around 100lbs. He got down to 66lbs and had trouble getting around. We had to carry him during his last week. The hard part was that his appetite and mind were perfectly fine. His body just grew too old. We would never let him suffer for our own reasons. That was the hardest thing John and I ever had to do. Neither one of us have ever been through that before. Luckily, we couldn't have asked for a better vet. He was so compassionate and explained everything to us throughout the procedure. We did our best to make him comfortable and feel safe. Wendel was the big brother to Bravo (11) and Trooper (7). He taught them both that everything in a home is okay and how to adjust to home life. Both Bravo and Trooper were extremely shy when we got them. They both loved Wendel so much. Wendel and Bravo were best friends and did everything together. His nickname was 'Angel' (which he answered to) because he was the perfect dog and literally did no wrong! I'm not saying that because I may be impartial - he truly was loved by everyone who met him. The neighborhood kids would run up to him everytime they saw him. Wendel's favorite place was the beach. We have a second home in Myrtle Beach because we couldn't bear to leave our boys behind when we went on vacation. They all travel so well in our mini-van, and love it there. If we had to go somewhere overnight without the dogs, my parents stay at the house with the boys. We were so lucky to have Wendel in our lives. He taught us so much and gave us an endless supply of unconditional love and happiness. I've enclosed some pictures of our boys for you; Also, a donation for Wendel's memory. Thanks for doing what you do. It is with deep sadness that our beloved Mimi passed over the rainbow bridge on December 30 after a year-long fight against bone cancer. She was only 9 ½ years old, but was was our princess, and during our last year together she slept in our bed every night. She filled our lives with great joy over the past 7 years. We miss her warm head nuzzling us at the dinner table, the cuddling, and the morning sun naps with her feet twitching in the air as she acted out her doggie dreams. There were no strangers to her, only new friends. My wife joked that walking her was like being with a “Rock Star”, as neighbors would stop whatever they were doing, even driving their cars, to greet Mimi. I want to thank you from the bottom of our hearts for bringing Mimi into our lives. We were a family of 3 and we miss her very much. We would like to make a donation in her memory, if possible. I just wanted to let you know that adoption #5452, STS Mudro, adopted on January 11, 2003 was sent to the bridge around 2am December 24th at the age of 12 years 6 months. She had a very large growth (tumor) on her liver and many smaller ones and was suffering. We had renamed her Bailey. Bailey is so very sadly missed and couldn't have been more loved. Thank you NGAP for choosing her for us and making the last 8 years with her so very special. Our lives were changed for the better because of her. We are deeply hurting right now ~ this is the worst part of having her, but she is worth the pain for all the years of Joy she gave us. I am sad to write this to you all that our senior Abby passed away last Tuesday. We want to thank everyone at NGAP for being so supportive and helping us to make sure she would not hurt anymore. Though Abby was only with us for 9 months she lived them to the fullest. In her short time with us she taught us that even 3AM can be a good time to play, and if you stand at the treat jar and stare long enough, eventually someone gives in. Every squirrel in our neighborhood knew Abby well, and though she did not hurt any of them, she certainly made sure that she kept them on notice. Thank you for sharing her with us, our home will not be the same without her. We are remembering her now and hoping she is surrounded by sunshine in heaven. Just to let you know the wonderful family dog you provided us with back in December, 2001, went over the Rainbow Bridge today. Bear was 12 yrs. old. 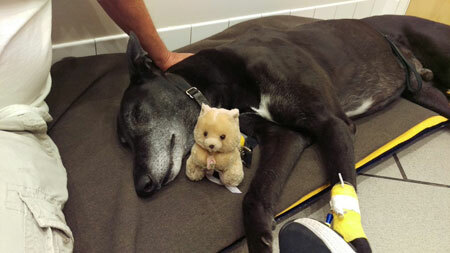 When we came to meet him and Bobbie brought Bear into the trailer, my first reaction was, "a black greyhound"? (we had never seen a black one) and "what's the deal with his ears"? They were up like a Doberman-one vet told us he probably had Ibezan in him. He was adorably quirky from day one and fit in with our family perfectly. My heart is broken but also relieved because his was a long decline yet he always showed a lot of happiness and made it hard for us to make the final decision. Damn greyhounds!!! They are always smiling!! I could go on and on because Bear deserves it, and he was like so many of the other greyhounds, but you all are well aware of their endearing ways. I know I want another one, but need a little time to grieve "my best boy". Thank you for our Bear. He started out as a feature story way back when. He came off the truck from Ft. Meyers near death and was a strong survivor. We were so lucky he became ours. Thank you so much for sharing your knowledge and your kind words with us regarding Angel. We also want to thank you for matching us with Angel. She was the most perfect dog for us. We asked for a dog that would travel well and she was the perfect traveling companion for us. She traveled as far as Yellowstone National Park in Wyoming, and Niagara Falls and Nova Scotia, Canada. Always the perfect Angel and the campground Queen! The heartache is too raw right now, but hopefully we'll be contacting NGAP in the future to once again add a member to our family. When Matt and I first met her in 1999, we were in our mid twenties, and she was two years old, genteel and statuesque. With Stella between us, we strode across the NGAP parking lot to our creaky old Pathfinder. Matt lifted the back gate, and immediately, Stella leaped inside. “That’s a good sign,” said the NGAP rep.
And it was. From the very beginning, she wanted to be with us. In the early days, she had two favorite activities: lounging near the piano while I played, and dashing across the fenced-in baseball diamond a few blocks from where we lived. She used to spin around, a three-foot-tall black cyclone; then sprint to centerfield; then lope back to the gate, spent. She liked Matt, but she preferred me. She followed me from room to room. She leaned on me after I came home from work. Often, when watching TV or reading books, I glanced over to find her gazing at me from the floor. Matt and I marveled at how well-suited Stella was for us. We took her everywhere. The beach in North Carolina. The hills in New England. Like us, she loved a road trip, an excursion, and the scents of the countryside. When we moved to Massachusetts, she came along. When we moved back to New Jersey, she was game. She didn’t care, as long as she was with us. Stella taught me the simple pleasure of strolling with no particular destination, and no curfew. She taught me that there’s nothing wrong with being quiet. She taught me that, if it comes naturally, you should wag your head, and not worry if most other dogs wag their tails instead. Above all, she taught me: Cling to your people. Through the years, Stella slept at the foot of our bed, settling herself down with a thud and a contented grunt, and falling asleep easily. That’s the only time she barked — in her dreams. She sat only once, in protest, the moonlit night I took her snowshoeing, and her boots filled with slush. And only once, in our eleven years together, did she try to bite: At the very end, as the needle entered her vein. 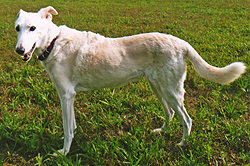 Lately, Stella resembled nothing of that leaping, deerlike beauty we first met on a hot July day in 1999. She was half-blind, mostly deaf, arthritic, underweight. Her toenail was busted after a terrifying spill down the stairs. Yesterday, when Matt took her outside for a meander, she collapsed. He carried her home. She was almost completely broken. And yet, she wanted to stay. She wanted to be with us. Loyal to the end, our sweet Stella. This is to inform you that our very precious Lizzie was put down on June 15th, 2010 due to osteosarcoma. She was 12 years old. 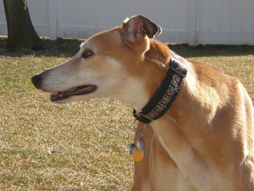 We lost our first greyhound, Jack, to osteosarcoma as well. She was our happy girl and a livewire, She was the best dog I have ever had the fortune to adopt. My husband passed away last August 9th, 2009, and my three dogs: Lucy a pit mix, and two NGAP greyhounds, Lizzie & Dickens were my major sources of comfort. I will always be thankful to NGAP for my two beautiful girls and for the enormous amount of joy they brought us. We adopted our sweet Ethel almost 9 years ago. A few months before we adopted her, we rescued another greyhound named Speed. Speed had severe separation anxiety so we decided to get him a friend. Ethel saved Speed's life and we all fell in love with her very quickly! 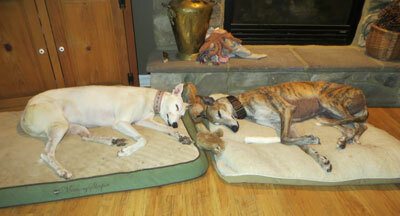 All four of our dogs (3 greyhounds and 1 italian greyhound) lived happily together for the last 9 years. She loved to lie on her bed and loved to snuggle with her toys and she always brought them outside with her to play. When we had our son 2 years ago she became his buddy. She always lay in front of his crib to protect him. She was diagnosed with Mega-esophagus in October and we did our best to treat her and keep her happy. We had to put our sweet Ethel to sleep on Saturday, June 5th after she had multiple seizures. We love her and we miss her so much. She was a very sweet girl and we know she s happy with her sister Fran. We love you, Ethel Princess! We adopted a gorgeous greyhound from you 11 and 1/2 years ago. her name at the time of adoption was Monica. We changed her name to Lady; she was in every way a true Lady. I am sad to have to tell you that Lady has passed on. She had a neck mass, and in all likelyhood another mass. She was a joy to our entire family for many years. She had a special place on our couch as well as our hearts. A the time of her adoption you were the only agency that would allow a family with 4 children under the age of 6 to adopt a greyhound. She was the best! Thanks! 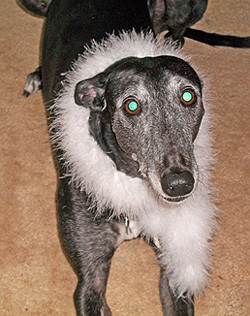 We are so sad to report that our beloved Hannah (renamed from Hestia) died on Friday March 12, 2010. She was almost 14 years old. Hannah had a very full life and although she joined our family only a year and a half ago, we feel as though she has been with us for a lifetime. 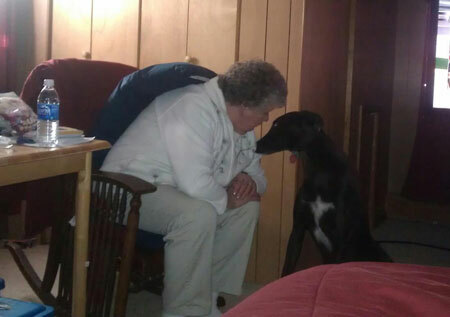 She has brought lots of smiles and laughs to everyone she met and helped our other greyhound Maggie learn to play! Hannah had lots of favorite things including cheeseburgers from McDonald's and running in the snow. 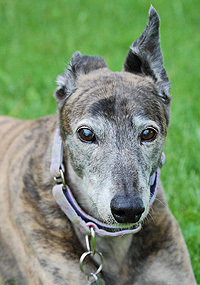 Our hearts are broken right now but we have received such love from her that we remain committed to adopting senior greyhounds and giving them a loving home. Hannah was full of love and because of her we are happier people. Our family loved her very much. Thank you for the opportunity to care for her. We had to send Buddy off to The Bridge last night to join Josh (poodle), Jessie and Brittne. They seem to be leaving us in the order that they came (were adopted). Buddy has been living with LSS for the last 3 to 4 years and he was not himself yesterday. He wasn't eating and had a very sad look on his face. Last night he could not stand, but worse than that, he was in so much pain that he could not lay down. He was actually sitting in a normal dog sit position but couldn't do anything else. When I first saw Buddy, he was a big (85 lbs) handsome, tuxedo black greyhound and the most gentle giant you could ever come across. I would walk him when my friends were coming down to find a grey that would be suitable for their household. Did I ever make the right decision when I decided I HAD to take him home after the third week of walking him. 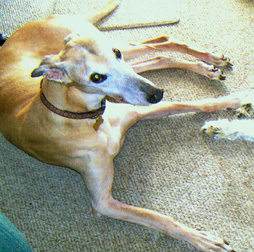 He was protective of us and his two greyhound sisters, but so loving and gentle with the grandchildren from day one. They would crawl all over him and he loved it. We couldn't stand to see this boy unhappy and in so much pain and chose to let him go so that he can run free again. Lucky Boyst was born 07/22/95, died March 2, 2009. 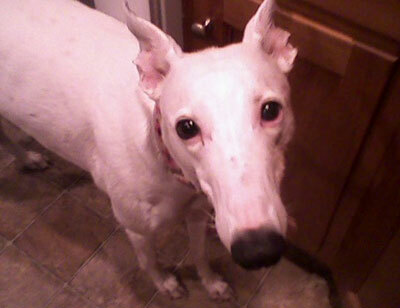 She was the sweetest, kindest greyhound there ever was. She was definitely loved by everyone. Her favorite word had to be 'biskies' (meaning biscuits). Loved every last one of them! We had her about fifteen years. We adopted her at the NE Philadelphia kennels at State Road. She will be sadly missed by friends and family and especially her sidekick, Shadow, our family cat who also recently passed away in May 2009. May they be reunited in animal heaven! I want to thank you for selecting Jeter (tag #5484) for me. He passed away last week. He was born November 8, 2000. He was only 9-1/2 years old. He was very ill from Central Vestibular Disease. It broke my heart as he had the kindest most gentle spirit. I miss him greatly but am thankful that I was the lucky person who got to adopt him. Thank you NGAP for bringing him to Philadelphia. When I adopted Jeter he was in the overflow trailer so I am sure I am lucky you even had him there. He was black with a curly tail. He had funny habits such as always wiping his mouth after eating. Waiting for his sister greyhound to eat first. Standing by me if he got wet so I could dry him off and many more cute behaviors that made he dear to me. 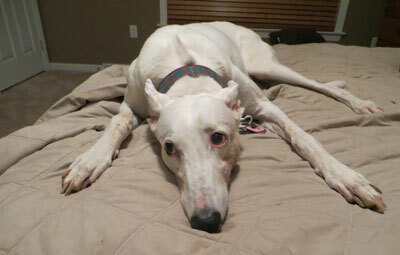 My other Greyhound, Lelia (tag #5787), has been quiet this week. She is normally so playful but she is just quiet. I am sure she is sad. So thank you for your dedication and kindness so that wonderful animals such as Jeter could bring love into homes such as mine. Thank you. In December 2003, I didn't choose King, he chose me. I've had the most priceless six years with King. Six years, seven Christmas cards. Our picture together would be on the front of the card and inside it was signed, "The King and I". He was the most loving, funny, entertaining and smartest dog I ever had. What was so priceless was not just how much I loved him but how much he loved me! He followed me all over the house. He stuck to me like velcro. He slept with me like a person with his head on the pillow. When I had insomnia, I would talk to him and reach out and rub his face. He had a disposition that wouldn't quit. He loved people and everyone who came to my home loved him. When I watched my favorite TV shows, he would climb up on my lap and watch them with me. At holiday time, you couldn't set your eggnog down - he would drink it. When I went out, he walked me to the door and when I came back he met me at the door. When he came in from the backyard and it was raining and muddy, he would stop short in my laundry room and wait for me to wipe his feet. He was beyond smart. He was 'high energy' and while I'm elderly, so am I. We were a perfect match. He was my significant other, my companion, my buddy, my kid, my life. I wanted to let you know that we sent Rose to the Bridge Friday night. She was the third I have sent to the Bridge in seven months. Rose was diagnosed in the summer of 2008 with Erlichia, Anaplasmosis and Rocky Mountain Spotted Fever. Although we did all of the medications, she ended up with nerve and muscle damage. Her muscles and nerves were really bad where she couldn't even get up for the last few days. Rose was 12 in August and she still wanted to run, walk, go for rides, but she just couldn't. LOVED her greeneies. We miss her terribly. Although I am still a big supporter of the greyhound cause ourlifestyle is such now that it's not feasible to have another greyhound. Perhaps in the future. I will still tell everyone who will listen and encourage adoptions. I am available to help if there are any lost pups in the South Jersey area. Thank you for everything. You all have been wonderful. 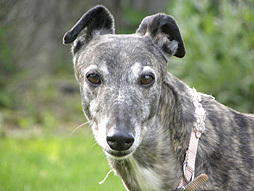 We regret to to inform you our beloved Sarah Fina (#6117), adopted 06/27/2009, passed away due to cancer on 01/08/2010. We regretfully only had 4 1/2 years with her but it was a splendid short time. She was loved by all that came in contact with her and was very special to our oldest daughter who walked her, raced her, and went on bike rides with her. She had two beds, one in our room at the edge of our bed and one in the living room by our sofa. She loved to walk the kids to the bus stop and to greet them when they came home. We shall always have a spot in our hearts for her... truly she was a part of our family and is now in a place where cancer cant hurt her anymore. We thank you for allowing sara fina into our lives as she made all of ours richer for knowing her. Spoiled dog? Yes .... Loveable dog? Yes ....Sadly missed? YES. Although Polar was with us such a short time, he brought us great joy. We miss him terribly. I still feel him with me in my heart. He was a great, gentle, funny dog. Well, I could go on and on about him. We gave him the best life we could and he gave us his best. He was a great big brother to Abby, he shared his toys, his bed and was very patient with her puppy ways. I have enclosed a couple of my favorite pictures of Polar and Abby. It is with a heavy heart that I inform you of the sudden death of our beloved Chitza. From the day Bobbie brought her out to us that very first adoption day, it was love at first sight. Chitza was big for a female, but she had a wonderful, youthful and exuberant personality that was evident everywhere she went. The people at the nursing homes we visited just loved her and she was always first to give kisses. She was especially helpful in the Alzheimer wing. I never knew a greyhound that could jump so high in the air to catch a frisbee. She loved her fuzzy lamb and any toy that squeaked. My family will miss her love of riding in the car and sniffing out rabbits at our mountain house. She will be greatly missed. Chitza will live in our hearts forever. Our little black girl, Brenna (adoption number 4518) passed away last Sunday September 20 at the age of 12 years 4 months. We adopted her in April 2000 and all these years she has been such a joy to us. Over the past few months she was slowing down and sleeping more but was her usual saucy self most of the time. She comfortably handled walks and playing with her toys and the much younger hounds in our household. I did note that when excited there was a raspy sound in her panting which was more noticeable the past few weeks. Last Friday afternoon she vomited followed by lethargy and episodes of panting. We took her to the vet but my heart sank because I suspected this was the end, as her behavior had changed so profoundly. I agreed to basic tests such as blood work and hydration. They kept her at the hospital over the weekend and when we visited her Saturday night she was slightly improved, but still did not seem interested in getting up on her own. Sunday she took a turn for the worse and by the time we rushed in, the vet had done an ultrasound and determined there was fluid in her abdomen as well as a pericardial effusion. The vet started explaining the procedure of tapping this effusion but we said no. We wanted to end her suffering immediately. She was lying on an exam table and it was clear that each breath was a struggle but she did seem to know we were there. So at that point the vet ended her suffering and she passed very quickly and quietly. All three of us Russ, me and my son Aaron were with her. The loss of Brenna is very deep and profound and there is a big void here. I especially miss her lying up on our bed with the pillows arranged just as she liked them. She was able to relax up there looking out a window. 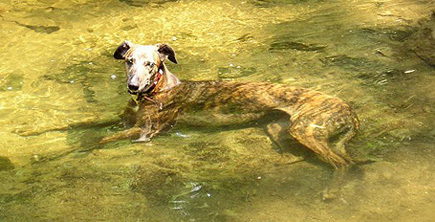 I am attaching a favorite photo of her soaking in the creek which she loved to do. She would walk carefully in to the deepest part, rest her head on the water, close her eyes and sigh. Would stay in there quite some time, especially on hot days and the rest of us would have to wait until she was good and ready to come out. Thank you very much for all these happy years we have shared with Brenna. We lost our Greyhound 'Apollo' last week. He would have been 14 years old in July. He truly was one of the family in every way. He went everywhere with us and he was loved by everyone. All the neighbors miss him as we would walk for miles. I don't know what we would do without the wonderful people at NGAP. Dr. Wolf and all the staff were there buy our side to comfort us. I'm so happy we decided to have him cremated. My husband picked up his remains today and we were in Awe over everything. The Box,the certificate...Words can not express how touched we are by the kindness of everyone in our time of sorrow. Thank you from the bottom of our hearts. I am writing to tell you of the passing of my beloved Butchie. I adopted him from NGAP in 1999 and he has been a loving member of our family ever since. He will forever live in the hearts of my son and I. I cannot imagine ever having a more wonderful companion. He will be missed every day. Thank you for the chance to have had such an incredible creature be part of my life. I am very, very sad to report that Cindy (#5591) went on to the Rainbow Bridge last Saturday morning. Each grey is special in its own way, and Cindy had this innate ability to make every person she'd meet feel like they were the most important person in the world. From the kids in the neighborhood, to the handlers at the kennel where she was an occasional guest, people absolutely fell in love with her. always knew when it was 9:30pm - cookie time! 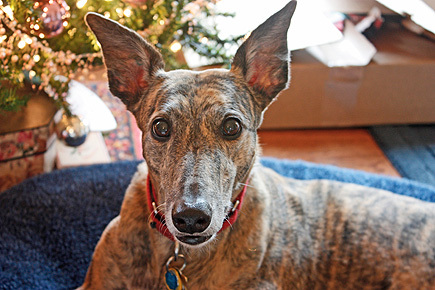 Thanks to everyone at NGAP for teaching us the ropes of taking care of a greyhound, and most importantly, for introducing us to our beloved friend. We wanted to thank all of you who knew and in some way cared for our two furkids, Petite Sirah and Shannon's Eagle, adopted from NGAP Philadelphia in 2002. They both went to the Rainbow Bridge in July and we miss them terribly. Each of you were a part of their lives in some way and we wanted you to know that we appreciate the care that you gave to each of them. You may have been their veterinarians, Dr. Amat or Drs. Patel; worked in the veterinarian office of Poplar Animal Hospital, East Lincoln Animal Hospital, or the NGAP clinic where they would get their nails trimmed; or worked in the kennel at NGAP in Philadelphia or Howl-a-Day Inn in Maiden where they were boarding. Each of you interacted with each of them and added greatly to their lives. 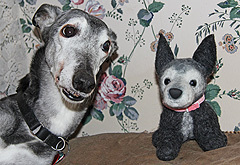 Thank you for helping to make it a greyt 7 years! A special thank you to David Wolf at NGAP for his support and advice whenever it was asked. It is with a heavy heart that I write to tell you that our beloved Miss Violet passed away on Saturday, 7/18 at 13 years old. 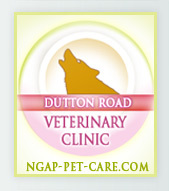 We originally adopted Noonan from NGAP when we lost our Dalmatian to liver disease. Ten months later, Noonan travelled with us to NGAP to pick out his lifelong friend, Violet. She had been with us for 11 happy years and we already miss her terribly. Our Maddi (5605?) (adopted in 2002) is doing her best to keep our spirits up, and her ability to literally smile when the chips are down is what is keeping us going right now. Violet was a very special girl. Whether it was recovering from a stroke two years ago, or bullying the neighborhood groundhog two weeks ago, she never ever cried. She was our caretaker, our nurse and our guardian. She was so sweet and sensitive and was a real trooper in every sense of the word. Thank you for bringing Violet into our lives and for making the last 11 years so much better for us. And thank you for all of your advice and medical care along the way. 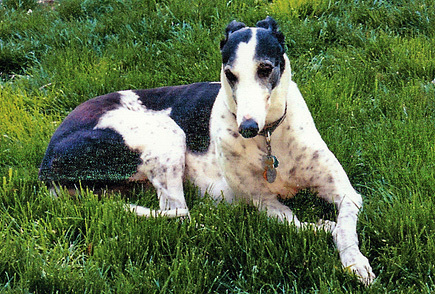 We remain grateful to your staff, and in particular, Donna – who although dealt with hundreds of greyhounds, always remembered our Violet. Needless to say, our hearts are broken. The sadness I feel writing this letter, words can not describe. 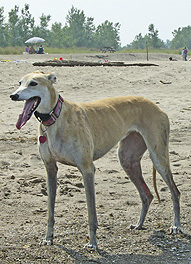 Dancer (adoption #5739) passed away July 6th of 2009. 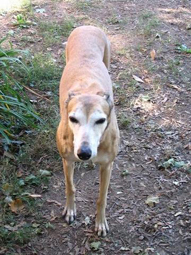 Dancer was more than a hound, she was a companion. Every day she would do something silly just to make you laugh. When I would go to visit my mother, she could feel my mother feeling down then do the same thing. That did brighten up my mother’s day. When my mother passed in April of 2008, she would see me feeling down and would go out of her way to come over to me, then put her head on my lap with those loving eyes as if to say "It will be okay, Daddy, I love you". The love and compassion she had was unmeasureable. She loved to run, just run. The smile on her face would go from ear to ear. On December 20th of 2008 I had to put her housemate, Racey (#4953), down. When I came home, she was lying on his bed, and the sadness in her eyes was just heartbreaking. That was the last day she did anything silly. Dancer just gave up on life without Racey. When I took her to the vet they did not find anything. She was 13 so we only took the tests so far. The blood work came back with no cancer and all the tests were negative. I have pictures of those two sleeping in the same bed, two hounds, three beds and a couch. They just liked sleeping together. They were watching tv and I snapped a picture were they had there paws crossed like they were holding hands. Not a day went by when we did not get a big hound hug. To hug two hounds together is priceless. If people had half the love of greyhounds, what a wonderful world this would be. Thank you for giving me the love of owning greyhounds. 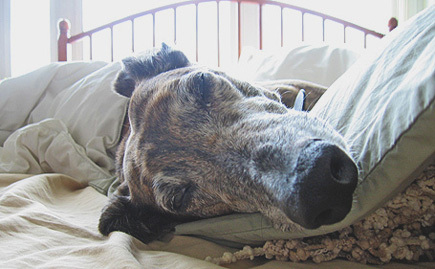 It is truly amazing what greyhounds can teach you. It is with a sad and heavy heart that I am posting this message. At 2:45 a.m. this past Sunday, I lost Balto, the love of my life. He was fine in the morning, but something happened during the day...I am now starting to believe he had a stroke, because he had lost almost all of his motor functions. I really do not wish to describe the ordeal as it is just too painful. He passed in transit from our house to VHuP. Not that it makes me feel any better, but I'm slightly comforted by the fact that he left me on his own terms. While I was prepared to have the vets euthanize him, if they determined it necessary, I'm glad that I didn't have to give them that order. To this day, I cannot believe that he was actually returned to NGAP TWICE before we were matched up. The first day I met him (Oct. 2000), the first thing he did to me immediately was the "lean" - I knew I found my new buddy that very moment. Because of having to do some traveling for my job, I knew that I wasn't going to be able to bring home my new companion until January 2001. 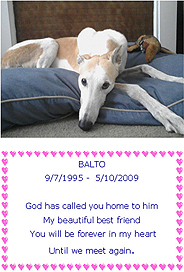 Until I got the NGAP stamp of approval to adopt, every day I hoped and prayed that Balto would be assigned to me. I still find it hard to believe that he was labeled a loud-mouthed, alpha dominate, trouble maker while at the kennel. He was nothing like that at all, even from day one. All he needed was someone to love him, and that I did. I'm actually thankful that his first 2 adoptive families returned him. I'm convinced, they didn't deserve to have him. He was a big part of our family, and we are all grieving. One funny thing - my father always liked the looks of Balto's bed. Just yesterday, he, in a very humble voice said, "can...can I have his pillow?" LOL - I said SURE! We'll wash the covers on it for you! I am SO thankful that this wonderful creature came into my life. The Lord blessed me in so many ways, and one of his greatest blessings was making sure that Balto and I were together. Run free my love...run free. We met Tinkerbell at NGAP on June 15, 2002. Barb brought Tinkerbell into us - she was a return and needed a home because she did not want to eat. We adopted Tink that day. She was a petitie red fawn. She enjoyed doing the Pet Expo's, the Home Shows and Dewey every year. 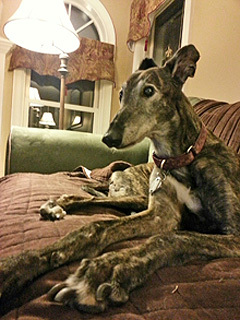 However, her favorite was Greyhound Sundays and checking out all the beds! Tink was diagnosed with Osteosarcoma in April and it was time to say goodbye on May 5th. Through Tinkerbell, we have become involved in an organization that is made of special and caring people that want to see greyhound rescue succeed - from the kennel workers, veterinary staff, caretaker, office staff and the volunteers. Thank you for all your kindness and compassion. Also, a special thank you to David Wolf and Donna McCann for being there on May 5th. 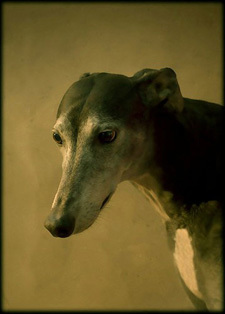 It is with great sadness and deep loss that my husband, Jeff and I tell you that our beloved grey boy “Henry,” racing name Sir Henry Morgan, adoption # 4541, passed away on Jan 15, 2009. He was 13 years old, and although we know that he is without pain now, we have a huge hole in our home and in our hearts. We miss him terribly. I adopted Henry in 2000 when he was 4 ½, the summer after I graduated from college. Together, we moved to Miami, Florida so I could attend graduate school. I often joked that Henry was truly living the “retired” life in sunny Florida with all the other human retirees! He had his cushy bed (although he preferred the couch), innumerable walks in the lovely Florida sunshine, and was a sight to behold at the dog parks in full-on gallop. My husband became part of our “pack” in 2002, and the three of us were very close—even driving home to NY and PA for Christmas and Thanksgiving holidays to visit with family. Henry loved car rides and he would anxiously await the departure, sitting in the back seat while we would load up the trunk. Upon graduation in 2006, we moved to Houston, Texas, and settled into a house with a big fenced in backyard, a perk that Henry enjoyed immensely, even up until his last few days with us. It was always amazing to see our grey boy run; even as old age was catching up to him, he instantly was young again when he sprinted. Henry always impressed everyone he met—graceful, handsome, gentle, and intelligent— just a few words used by strangers and friends to describe him. He was always a hit in the neighborhood too; most people knew him by name and would stop to say hello whenever we were out for a walk. Although Henry had an arthritic shoulder, he developed a significant limp in mid January. He would normally rebound after a treatment of NSAIDs, however, when the drugs did nothing to alleviate the pain and discomfort, we took him to an orthopedic specialist, thinking (and hoping) that he had injured himself running in the backyard. Sadly, it was not a torn ligament or muscle injury, it was bone cancer. Not wanting to put Henry through any more pain and discomfort, we decided against amputation and chemotherapy. We believe that Henry deserved a graceful and peaceful end of life. In those final days, indeed, throughout his life with us, and ultimately at the very end, Henry was surrounded by Jeff and I, and our love. With the help of our vet, Henry passed away in the most compassionate and gentle way possible. It was, at the same time, the most difficult and the easiest decision we’ve ever had to make; easy because we knew he was in so much pain, but difficult because Henry was such a huge part of our lives. We often marvel at the perfect pairing you made with us and Henry—our temperaments were such a wonderful match and I don’t think we could have picked out a more perfect dog on our own. We need some time to let our emotions from Henry’s passing heal, however, we would welcome the opportunity to adopt from NGAP again in the future. 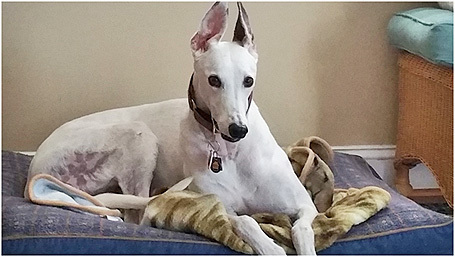 Jeff and I love the Greyhound breed immensely, and would love to have the opportunity to bring another retiree into our home. We also wanted to write you to let you know of Henry’s passing and to thank you for the opportunity to have adopted him. He brought us so much joy and happiness, and we feel truly blessed to have had him in our lives, if only for 8 ½ years. We wished it could have been longer, but we know that Henry will always be with us and in our hearts, and for that, we are truly grateful. We are sad to announce that Bon-Bon was put to sleep yesterday evening, April 15, 2009. She was 13 years old. She had suffered steadily declining function in her hindquarters since the end of March. Rimadyl and opioid treatment were effective early on, but it became clear in the last few days that it was a losing battle and the right thing to do was to end her pain. Bon-Bon and her pal Tulsa (who went to the Bridge in January) came into our home and our hearts in September 2007 at 12 years of age. They joined Breeze, who was left alone after Josh and Robine's passing that summer. In her brief 19 months with us in her last "forever home", Bon-Bon touched our lives in so many ways. We'll always remember her pigeon-toed walk, and her big toothless grin with the "Elwood tongue" hanging out of the side of her mouth. Most of all, we'll remember Bon-Bon's bouncy, exuberant joy of life that greeted us each morning. She is dearly missed by the canines and humans she leaves behind. 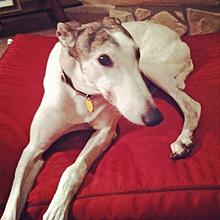 I just wanted to advise you that our beloved greyhound, Cozmo(adoption #5460, Eatoo, 1/31/02), has passed away from cancer last Friday 1/23/09. While we are so deeply sad from his loss, the incredible joy he brought into our lives, and hopefully we into his, that the pain of his loss is at least a little dampened for us. While we need just a little bit of time to mourn his loss, we will certainly be back down to the kennels shortly to see the hounds when you let them out to run and see the next "Cozmo" waiting to come to his or her "forever" home with us. Thanks so very much for doing what you do. We will see you shortly. I'd like to extend my deepest thanks for blessing me with a lifelong friend when I adopted Red Man back in January 2000. He was by far the sweetest dog I had ever had in my life. He came into my life when I needed him most after tragically losing my first husband to sudden cardiac death, He filled my heart with love and was a great pal for my 2-year-old son Andreas. We shared many beautiful days with him! Unfortunately, he was diagnosed with an abdominal mass back in April 2008. 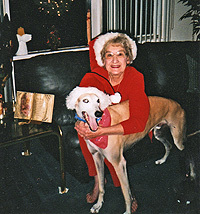 I chose quality of life (he was 11-years-old) at that time and allowed Red to live comfortably for 8 long months. The vet estimated 3-6 months. He really was a trooper. Toward the end of his life he exhibited pain that was managed with daily Rimadyl. When the time had come that I saw he was in untreatable pain, I made the decision to lay him to rest. I stayed by his side as he fell asleep. It was very peaceful. I will miss my 'Gentle Giant' as this is often what I called him. Thank you for giving me the opportunity to own one of these amazing animals. The greyhounds you save each and every day are worth all the effort in the world - your commitment is greatly appreciated and respected by many. I have attached a picture of Red fro this past summer. He was a beautiful animal, and will be greatly missed. Anyone who met my Red loved him. With great sadness I must report my beloved "Treat", adoption #2974, passed away on February 10th. He suffered a seizure at home and quickly went downhill. The "final gift" was administered with extreme compassion and dignity. He was 14 years old. I was truly blessed to have him in my life. He showered me with unconditional love each and everyday. 12 years ago when we started our lives together, I thought I had rescued him. After his passing, I realized it was Treat who really rescued me. He was the sweetest boy. 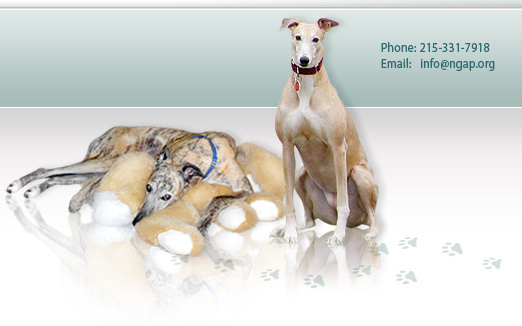 Special thanks to Gay and Sam Latimer, wonderful people doing wonderful work bringing greyhounds and people together. It is with a sad heart that I tell you that our Tulsa went peacefully to the Bridge this evening. She had been in gradual decline for several months, and today she let us know it was time to leave. 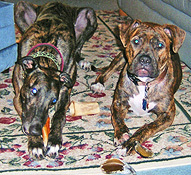 Tulsa and her pal Bon-Bon were featured in an article in the 2007 NGAP newsletter. They were returned to NGAP at 12 years of age. 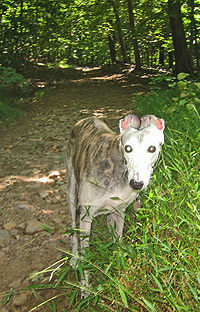 We had lost two of our hounds in the span of six weeks during the summer of '07, leaving one lonely girl Breeze. Tulsa and Bon-Bon were just irresistable and perfect additions to the pack. Though her time with us was all too short, we're glad to have been her forever home. She is missed by the canines and humans she leaves behind. with Josh, Robine and Tulsa at the Bridge. It's been 5 weeks since I lost Harley and I'm just now able to write this email. I adopted HARVEY (I don't have his number here with me at work) from you in October 2003. We changed his name to Harley and took him home to Delaware. He had a greyt life at his new home and enjoyed the retired life of a greyhound....eating and sleeping and sneaking into my king size bed when I was at work!! I could always tell when he had been up on the bed, the covers would be all bunched up in the middle. On Friday morning February 6, 2009 it was like any other morning where we would get up go out to do our business then come back in the house and have breakfast. Every morning Harley would gallop up and down the hall being a "race dog" come and get his treat then eat his breakfast. This particular morning he galloped down the hall and let out a yelp. I assumed maybe he had gotten tangled up in his blankets and ran down the hall to find him thrashing in the doorway to our bedroom. He tried to get up but was unable to and I cradled him in my arms and he was gone in a minute. He had never been sick and was always healthy. I have no idea what happened and that is the hardest thing for me to understand and accept. 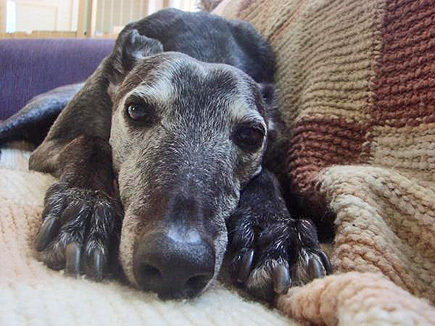 I miss him everyday and I want to thank you for giving me the priviledge to own such a greyt animal for the past 5 years. This is to notify you that our Edward was euthanized on Feb 10, 2009, after a turn for the worse and a major seizure. We think he was 18 or 19 as we could not read his "old" tattoo. We miss him tremendously, as you see "Ed-tard" was very different than other gray. He alked...incessantly!! He also sang along with you. He walked himself by taking his leash in his mouth..really he walked my husband! The neighbors will miss his evening visit this summer as he made his rounds. 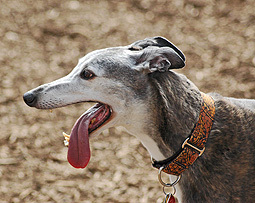 He did not have many teeth left and his tongue always hung out the side of his mouth making us laugh as he looked like a "dork" Thus the name ED-Tard! He also loved boating, but this limited family participation as he claimed the entire seat across the back of the boat as his throne. My husband will miss Ed as he was a "chick" magnet when walking the piers and neighborhood. No one could pass him by without a touch and a word. I can not stand the silence and loss of my friend so we will be visiting you soon to choose our next companion. At 2:11 this afternoon, Wallace took the "escalator" to be with his sister Wish in heaven (who took the elevator). As many of you know, he had diarrhea for the last several weeks that wouldn't respond to medications. The hardest part of all, was his mind was still sharp (well, as sharp as Wallace's mind could be) until this morning. For lunch we went out and got him a 6 piece nugget meal, which he ate 5. He LOVED McNuggets. We took him to the clinic and everyone agreed he was ready to go, he was sooo tired looking. Dr D who works for us was kind enough to do the deed, and Rox our tech and Bill were with him at the end. I had to leave the room...I just couldn't deal. Bill said Wallace just went peacefully to sleep...no struggle, no funny looks, no vocalizing. We are having him cremated, and he will then be with Wish. We got him in June 2000 at NGAP, and he was on the "male sale" list. His racing name was Scuppa Doozy, but the staff called him "just Joe." He was a great camper and trail blazer. When his sister Wish died in Jan 2006, he actually cried. He cried. He was happy when we adopted Noel and Laci in Feb 2006 within 2 weeks of each other. He would bark and give them hell in his day! When female friends would visit, they always asked about "B-Boy." He was a real "chick magnet"...all the girls loved Wallace. There will be some sad girls in the world tonight. Wallace will be sorely missed. He was a great "roo-er" and a chatterer. Wallace was 12 1/2 years old. It is with great sadness that I contact you to let you know that my wonderful "Judge" was put to sleep on February 25th, 2009. He had just turned 10. Judge has been my constant companion since I first met him at your agency in April of 2001. Everyone who met him fell in love with him instantly. 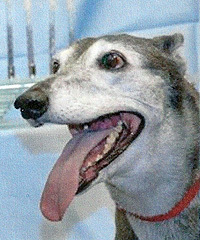 When I was living in NJ, and would return to the agency for Judge's routine dental exams and physicals, everyone would comment that he was the largest grey they'd ever seen. I thought I was adopting a horse when I first saw him running in the yard at NGAP! After years of excellent health, Judge started feeling poorly last November, right around Thanksgiving, but after several trips to the vets during the last three months, nothing could be found. His appetite remained strong most days, but his activity level decreased, yet he was losing weight, and having difficulty laying down and getting up. Despite not feeling well, my buddy was always waiting for me at the door when I got home from work, and did his goofy little dance I adored so much. He was truly the love of my life. During an exam in late February, in preparation for some dental work, the vet noticed Judge's abdomen was swollen, and ordered an ultrasound, which indicated widespread cancer. Knowing he was in discomfort and pain, and watching his health go downhill so quickly, I made the hardest decision of my life. 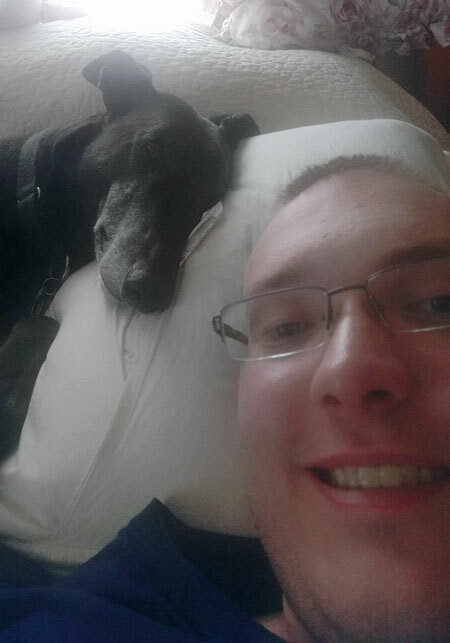 I will be forever greatful for the 8 years he shared with me, and I hope that someday in the not too distant future, I will bring home another greyhound, who will touch my heart the way Judge did. Thank you NGAP for all that you do to give these wonderful creatures good, loving homes, and allowing our lives to be so deeply touched by them. It is with great sadness that I must tell everyone that Stella, aka Love, the pregnant Galgo brought to us five years ago from Spain who delivered thirteen wonderful puppies, was put to sleep today. Stella was supposed to come to us in December of 2003. When the dogs were being off-loaded in Madrid to fly to Philadelphia, their passports were left sitting on top of the van when they took the dogs in. Of course when they returned, the passports were gone. Subsequently the dogs could not fly that day and they were housed in a kennel in Madrid. While there, Stella became very friendly with one of the males and when she finally arrived in Philadelphia in January of 2004, we were told that she might be pregnant. We decided that if she was pregnant we would not spay her and give her the opportunity to have her puppies. Kennel staff named her ‘Love’ because she truly was a love. On March 13, 2004, thirteen puppies were born! One week after their birth, they were brought to my home and spent their formative months being cared for by my wife, Gerda. When Love was taking a break from nursing she rested comfortably in our sunroom. Occasionally she would chew on one of our wicker chairs. Although we have since gotten new furnishings for the sunroom, our galgo Tye, one of her sons, still sleeps on that chair everyday. It was very difficult for us to adopt her out. She was such a spectacular mother and such a spectacular dog! But we found the perfect people, Jack and Mary Jo Bucceri . They took Stella into their hearts and home and truly loved her and cared for her every day of her life. Jack & Mary Jo brought Stella to our clinic facility last week on March 6, 2009. We did an exploratory on her and removed a spleen that was just gigantic. We felt that by doing so, we would give her additional time to enjoy her life. However, she was also suffering from significant liver related issues and unfortunately it was not meant to be. While she was with us this past Sunday, she was visited by two of her sons, Gerda and my grand daughter, Kirsten. Stella, aka Love, will live in our hearts forever. There is something extraordinarily special about this beautiful girl who touched us to our very core. She loved everyone, and everyone loved her. Stella, the 'star' of our lives, shined brightly upon us and made us better people for gracing us with her loving presence for almost five years. And above all else - MINE. Run free now, precious and beloved girl, until the time when our hearts will be joined together once again for all eternity. It is with sadness that I must tell you that our beloved "Troy", racing name Greek Metaxa, adoption #3445 passed away on December 16th. He had been ill for a day or two and when he refused his dog treats and vanilla ice cream I knew something was very wrong. He quickly went downhill and suffered a seizure at home. We were fortunate that we were able to rush him into see Dr. Patel at her Newtown office immediately. She quickly ended his suffering in the most compassionate and gentle way. Troy was surrounded by myself, my husband Tom and my children who thankfully were home on college break. I could tell from his eyes he was tired and ready to go. He was 13 years old. Troy came into our lives in 1999 at the age of 3 ½. He was a beautiful white and brindle ticked color. He lived happily with his brother "Jack", JCK Attilla, who passed in August of 2006. Troy lived the good life having access to all the beds in the home, long walks in Tyler State Park and weekend trips to our shore home in Ocean City, New Jersey. Troy was a wonderful companion and we were so lucky to have him in our lives. He will be truly missed! 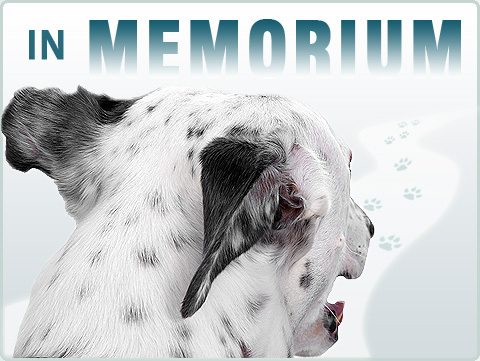 I wanted to thank you also for the superior service you provided us with Troy's cremation at All Pets Crematory. I made one call and Troy was picked up promptly at Dr. Patel's office. A special thanks to Terry who walked us through the process and had such a calming and professional demeanor. A sorrowful time was made easier with her help and my family and I so appreciate it! The beautiful wooden remembrance box is lovely and large enough to accommodate both Jack & Troy and their collars. 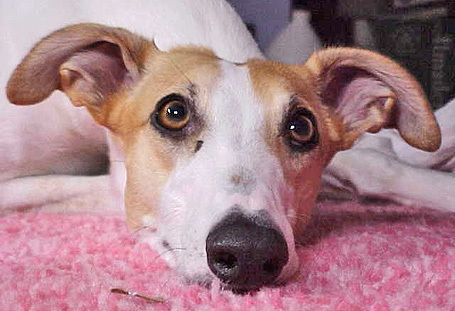 We will be in contact with NGAP for our new family member soon as we will always have a greyhound in our lives.